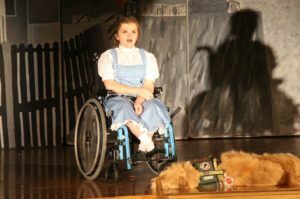 17-year-old Erin Bischoff, who plays Dorothy in Hasbrouck Heights High School’s production of “The Wizard of Oz, sings proudly on stage. The only difference between her and others who have played the iconic character? She’s in a wheelchair. Miss Bischoff, a senior, was born with osteogenesis imperfecta, commonly referred to as “brittle bone disease.” Essentially, this genetic condition causes one’s bones to break easily. Despite this, she makes the best of things. She’s been performing since she was in sixth grade. This is the first time she’s played a leading role. 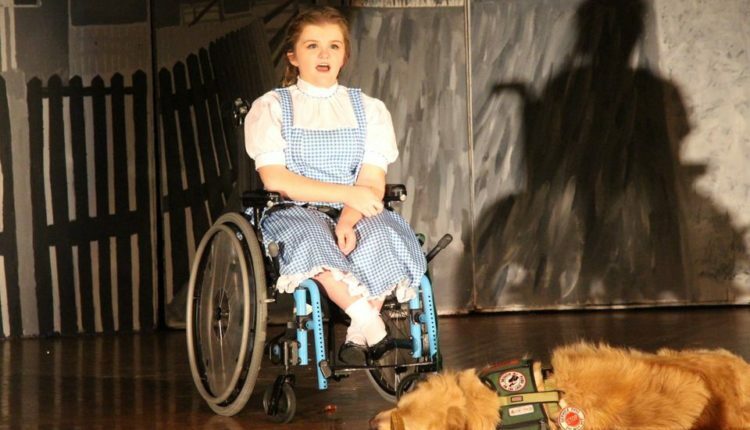 Erin wasn’t alone on-stage, her service dog, Gauge, stayed by her side the entire time. 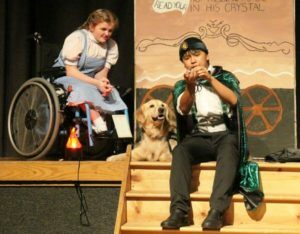 The golden retriever has accompanied her for nearly all of her performances during her high school career. 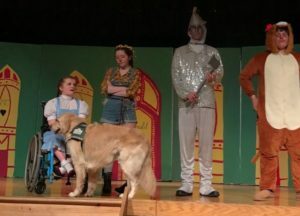 In all of their previous shows, Gauge was not written into the story as a character, but that’s different for this time, because he’s playing Toto. Audiences are loving the school’s performances of the “The Wizard of Oz” so far. Those who know Erin are adamant that she’s a tough, committed young woman. Paula Jacobs, the director of show, had nothing but praise for the young actress. Despite all of this, Erin keeps a level head. She doesn’t see herself as any different than her peers. We hope we’ll be hearing more about Erin in the future, she might just see her name in lights one day!